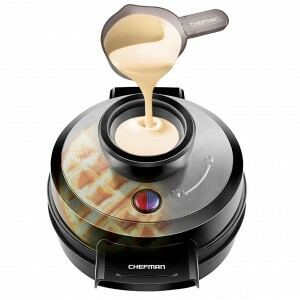 If you love waffles then you will definitely know that there are so many unique waffle makers out there. Therefore choosing the ideal waffle iron for you can be quite a challenge. In this waffle maker review, we have tried our level best to highlight some of the best waffle irons and the features that make them unique. Keep reading to find our which waffle maker fits your needs perfectly. Enjoy! It comes with dimensions of 9.3 x 16.3 x 10.4 inches and a net weight of 20 pounds. It is made of a ceramic shield non-stick coating and the waffle plates are also nonstick. It is designed to bake at a constant temperature. It comes with an LED digital display that has a timer with an automatic shut off feature. It comes with double sided baking capabilities. It is designed with a drip channel. Any baker will enjoy using this waffle maker since it bakes at constant temperatures for consistent results and it is also designed to bake from both sides. It also comes with a drip channel to save you the after baking cleaning work thanks to spills. You will also love it that the baking plates are made of not stick coating which makes cleaning them very easy. However, this waffle maker is quite highly priced and is quite heavy. 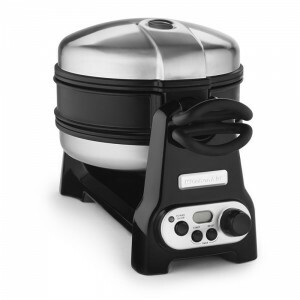 The baker lids and the handles are made of stainless steel which gives this waffle maker quite some durability since stainless steel is very strong. It limits the chances of you burning anything thanks to the automatic shut off feature that works with the timer to ensure the baker is shut down when a set setting is achieved. You can expect the end results of the waffles to be smooth and evenly baked since it is designed to bake at a constant temperature. This Belgian waffle maker will also ensure you get the best results thanks to the fact that it has the ability to bake from both sides to achieve consistency with the waffles on either side. It will help to maintain a neat kitchen thanks to the drip channel that will help to prevent overflow and spills. It is made of non-stick coating on the plates which will make cleaning afterward a very easy affair. - It comes with dimensions of 10 x 8 x 4 inches with a weight of 2 pounds. - It comes with plates made of non-stick coating. 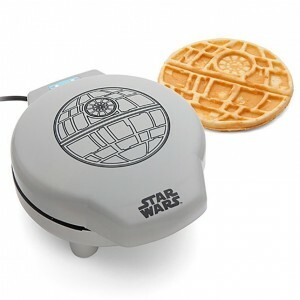 - It makes waffles that are shaped like the Death Star in star wars. - It has an indicator light that lights up when the iron is hot. - The plates are made of aluminum cast iron. Star Wars fans will really love this waffle maker thanks to its Death Star waffles. It is also value for money since it will serve you for a very long time due to the durable cast iron which makes it long lasting. Your safety is also protected with this waffle maker as it comes with an indicator light which will alert you when it is hot. However, it can take up a lot of your time if you are making many waffles since it can only make one waffle at a time. It is quite small and compact which means it will take up very little counter space at any given time. 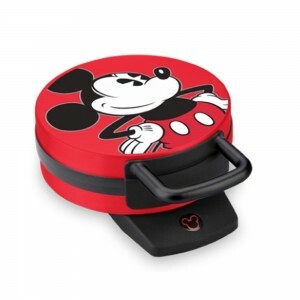 It comes with non-stick cooking plates that are very easy to clean. If you are a star wars fan then you will find its death star shaped waffles quite enticing. It upholds your safety thanks to its indicator light which lets you know when it is plugged in and hot. You will be able to make evenly baked waffles since it is made of aluminum cast iron which distributes the heat evenly during cooking. It is also quite durable since the cast iron that makes most of its components is not affected by rust. 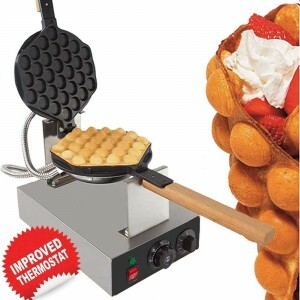 It can only make one waffle at a time which can be very time-consuming in case you want to make many waffles. It comes with dimensions of 9.5 x 7.2 x 3.8 inches with a weight of 2.5 pounds. It has non-stick baking plates. It bakes 6” Mickey Mouse shaped waffles. It comes a with a power indicator light. It is designed with non-skid rubber feet. It uses 800 watts of electricity. It comes with dimensions of 8 x 11 x 5 inches and a weight of 5 pounds. It grants you access to club Chefman. The baking plates come with non-stick capability. It comes with a pouring pout connected to the base. It is designed to be stored in an upright position. It comes with a free measuring cup. I love the fact that this waffle maker has gone a long way in ensuring that your kitchen is mess free once you are done thanks to the pouring spout that it comes with. You will also find that storing it is very easy since it can be stored in an upright position. It will also enable you to get the right measurements thanks to its measuring cup. However, I feel it would have been better if the pouring pout holes could handle more ingredients and it came with an indicator light and a timer. It is small in size so it will take up very little space on your kitchen counter. Purchasing it grants you access to the club Chefman so that you can access a diverse number of recipes. It is one waffle iron that is so easy to clean since the baking plates come with non-stick capability. You do not need to worry about the amount of storage space it will come up with since it is designed to be stored in an upright position. It will enable you to get the precise measurements before baking thanks to the measuring cup that it comes with. Your kitchen will not be messy once you are done with it since it comes with a pouring pout that guides all the batter to distribute evenly. The pouring pout does not come with holes that are big enough to allow other ingredients mixed in the butter to pass through. It does not come with a timer or an indicator light. It comes with dimensions of 7.5 x 10.6 x 3.9 inches with a weight of 3.3 pounds. It bakes princess waffles that are 6.5 inches in size. It has an indicator light that beams during baking. Its baking plates are made of nonstick coating. 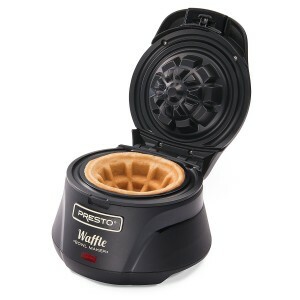 I recommend this waffle maker since it is very easy to clean and is small enough not to take up too much space on the counter. 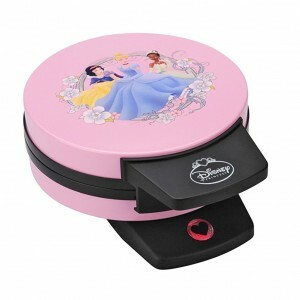 It also makes decorated princess waffles which your kids will love. One area they could improve on though is the material they use to make the handle so that It does not heat up when you make several pancakes. It is quite small in size so it does not take a lot of space on the kitchen counter. Your kids will look forward to their waffles since they are made in a much more interesting manner. It will notify you when the baking is happening thanks to the indicator light which turns red. This can also be very critical for your safety to help avoid burns. 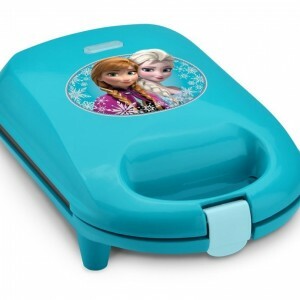 It is so easy to clean since its baking plates are made of non-stick material. The top handle of the waffle iron gets very hot when it is used to make several pancakes. It comes with dimensions of 11 x 12.5 x 16.2 inches with a total weight of 4.3 pounds. It comes with a timer that beeps when the waffle is ready. The cooking surface is made of non-stick material. It comes with three settings – Crisp, moist Exterior and uniform texture. It can make five heart-shaped waffles at the same time. It can be stored in an upright position with an in-built cord storage compartment. It comes with the quad baking system which offers a variety when it comes to texture, flavor, and color. It comes with an overflow grease channel. It comes with dimensions of 7.9 x 9.7 x 3.3 inches with a weight of just 2.7 pounds. 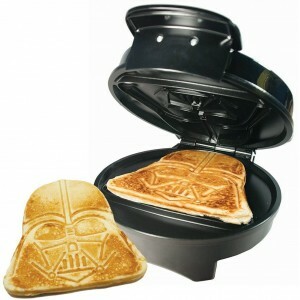 It comes with non-stick Darth Vader cooking plates. It comes with five temperature settings and dual indicator lights. It comes with a thermostat and a heavy lid. It can stand upright for storage and the cord wraps around the base. It comes with dimensions of 19 x 12 x 13 inches and a weight of 13.5 pounds. Its handle is made of wood. It is a bubble waffle maker. It has a thermostat for getting the precise temperature measurements. This Egg Puffle waffle is a great departure from the norm since it will enable you to make waffles that are bubble shaped. It is also quite durable given that it is made of stainless steel. It is also the first waffle maker which I have seen made of a wooden handle which will help protect your hands since wood is a bad conductor of heat. However, you can only make one waffle at a time which is very time-consuming. It has very small dimensions; therefore, it takes up very little space. You can expect it to serve you for a very long time since it is made up of stainless steel which is rust resistant. 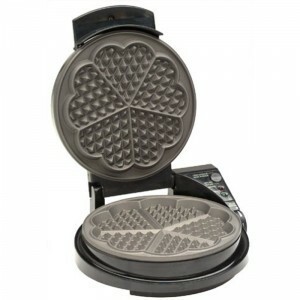 It is one waffle maker that is made of non- stick coating which is very easy to clean. Since the handles are made of wood it is very hard to experience any kind of burn from making many waffles at the same time. It comes with a thermostat and different settings that will ensure you are in direct control of the waffle iron to make waffles according to your preference. It can only make one waffle at a time which can be time-consuming in case you intend to make many waffles at the same time. It comes with dimensions of 9.3 x 8.2 x 5.2 inches with a weight of 3.5 pounds. The waffle bowl is made of non-stick material. It comes with a manual that gives directions on how to use it. It makes thick 4” waffles that are bowl-shaped. The finish is made of plastic and nickel. You can get quite creative with your fillings with this waffle maker thanks to its ability to make bowl-shaped waffles that you can fill with eggs, ice-cream or fruit. I find it quite ideal that it also comes with a manual that will help you know how to operate it. It also has quite a classy finish thanks to the combination of nickel and plastic that is used to make it. However, you will need to spend more in getting a converter as the electrical requirements are only limited to American standards. It takes up very little kitchen space since it comes in very small dimensions. It is easy to clean since it is made up of non-stick material. It is very easy to setup and operate since it comes with a manual that is easy to follow. You will be alerted by the indicator when it is time to pour the ingredients into the bowl thanks to the indicator light. Since it makes bowl-shaped waffles you can easily fill them with your favorite fruits or other fillings for an enriching meal. It is quite durable and looks quite stylish since it is made of a combination of nickel and steel. The electrical requirements of the manufacturer are not universal so if you intend to use it somewhere else you will need electrical converters. It comes with dimensions of 6.8 x 9.6 x 4.4 inches with a weight of 1.8 pounds. It makes snowflake shaped Belgian waffles. It has a power indicator to alert you when the waffle maker is hot. It is made of non-skid rubber feet. The electric cord wraps around the feet for storage. The baking surface is made of non-stick coating. You will find it quite easy to clean this waffle maker thanks to its non-stick cleaning surface. Something else is that it is quite lightweight, has rubber feet and takes up very little space on the kitchen counter. Storage has also been made very easy thanks to its size and the wraparound cord. Although one thing that you will not like about it is that it makes only one waffle at a time which can be very time consuming if you intend to make many waffles at the same time. It does not take a lot of kitchen counter space since it comes in small dimensions. Getting burns from it is quite unlikely since it comes with a power indicator to alert you when it is plugged in and hot. You can trust it to be firm and steady when you place it at a certain spot since it has rubber feet that prevent skidding. It lets you know when it is plugged and hot through its power indicator so getting burnt from it is highly unlikely. You will have an easy time when it comes to cleaning it since its cooking surface is made with nonstick coating. It is so easy to store since its cord is a wrap around and it is quite small so it does not take up much of the storage space. It only makes one waffle at a time which can be very time consuming if you are making many waffles at the same time.